1. To make the rosti, grate the potato into a clean tea towel and squeeze any excess water out. Pop the potato into a bowl and season, then add the egg yolk and mix well. Divide into four and then form into rosti shapes. 2. Place a non-stick frying pan over a medium heat and add the sunflower oil. Carefully place in the rosti and cook for 4-5 minutes before turning over. The rosti should be golden and crisp before turning. 3. While the rostis are cooking, place a large pan filled with water about 3 inches deep for poaching the eggs with the vinegar. This water should be barely simmering. 4. For the hollandaise, melt the butter in a jug (the microwave works very well). The butter must be hot. Place the eggs and vinegar into a bowl and, while whisking, slowly pour in the melted butter a little at a time. Leave the white sediment in the jug. Add a squeeze of lemon juice and a tsp of hot water and leave until needed. 5. Cook the asparagus in a small saucepan of water for 3 minutes. Crack the eggs into the water with the vinegar and poach for 3-4 minutes for a runny yolk. 7. 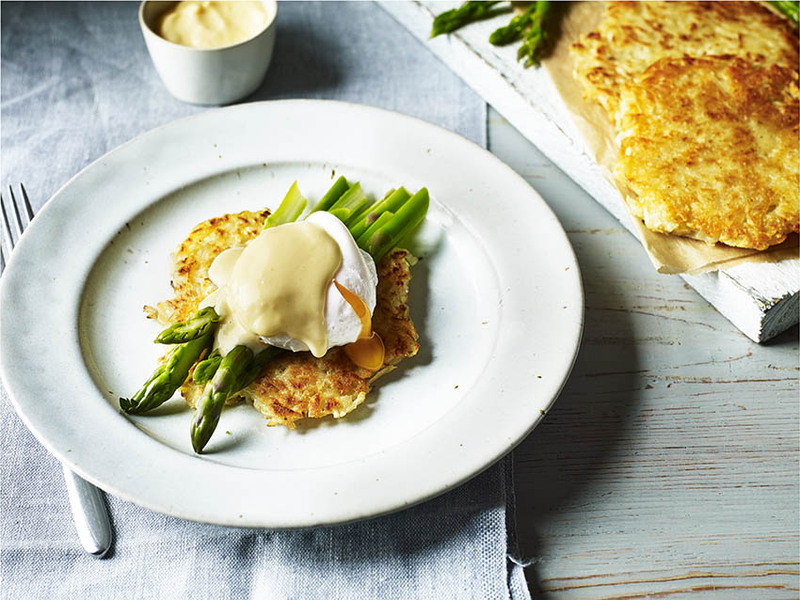 To assemble divide the rosti among four plates, top each with asparagus and a poached egg, then finally drizzle over a little of the hollandaise sauce. CHEF’S TIP: If you have a chef’s ring, place into the frying pan and press the rosti mixture in. This will give you a lovely professional look.